You are going to Watch Cardcaptor Sakura Episode 55 English dubbed online free episodes with HQ / high quality. 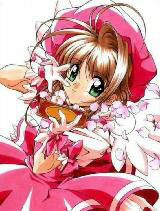 Stream Anime Cardcaptor Sakura Episode 55 Online English dub Sakura and Sakura From Wonderland, While reading Alice in Wonderland, Sakura is sucked into the book’s fantasy due to another of Eriol’s enchantments, this time on a leaf he gave Sakura to use as a bookmark. There she meets the story’s characters who have taken on the forms of her friends and family: Eriol is the Cheshire Cat, Yukito/Yue is the White Rabbit, Toya is the Mad Hatter, Syaoran is Tweedle-Dum and Tweedle-Dee, Tomoyo is Humpty Dumpty, and Kero is the Red Queen. During the adventure, Sakura converts the Big and Little cards (in fruitless attempts to use them to her advantage), and discovers that Syaoran likes someone else other than Yukito. In the end, she manages to find the enchanted leaf floating in the sky and flies through it, allowing her to escape the book.